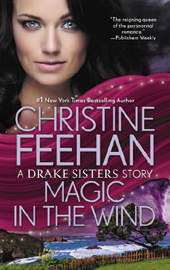 Praised for her blend of "action, suspense, and...erotically charged romance" (Booklist), New York Times bestselling author Christine Feehan presents the story of Sarah, the eldest of the extraordinary -- and magical -- Drake sisters. "Sarah's coming home." Ever since Damon Wilder sought refuge in Sea Haven, he's heard the same breathless rumor pass the lips of nearly every local in the sleepy coastal town. Even the wind seems to whisper her name -- a reverie so powerfully suggestive that it carries the curious Damon to Sarah's clifftop home, and seeks to shelter him there. 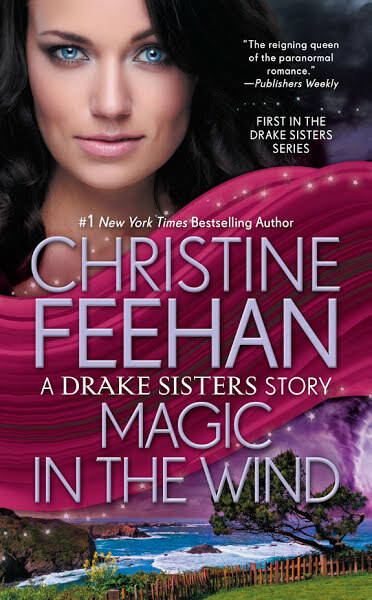 Sea Storm includes two Drake Sisters stories: Magic in the Wind (the new, expanded edition) and Oceans of Fire. 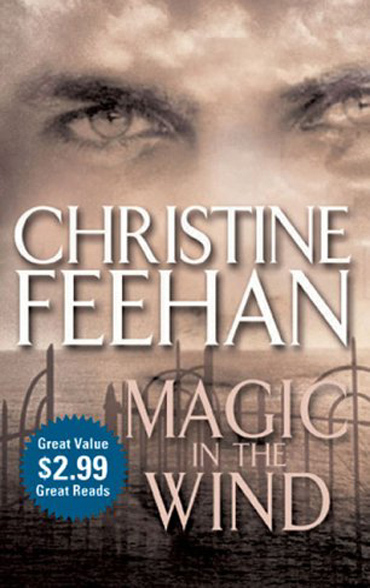 This version of Magic in the Wind has been rewritten and expanded, in a very special collector's edition. 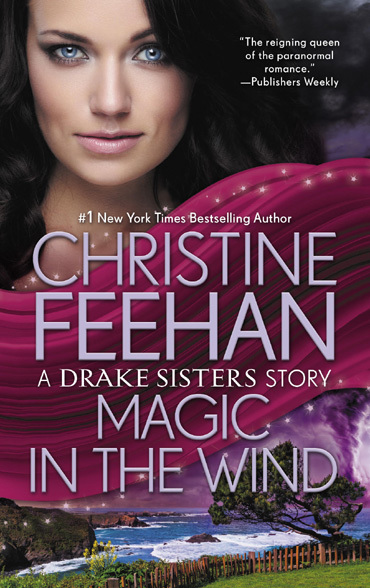 Includes: Magic in the Wind by #1 New York Times bestselling author Christine Feehan; Hot August Moon by international bestselling author Katherine Sutcliffe; After Midnight by #1 New York Times bestselling author Fiona Brand; and Only Human by #New York Times bestselling author Eileen Wilks. I have to admit this was a book of the heart. Seven sisters interacting, all magical and capable of extraordinary things. A town filled with wonderful people seen, first through the eyes of a stranger who can't accept them, and then seen through the eyes of one who loves them for all their differences. This is book of magic, of love and tolerance. . . well, with a bit of suspense and action thrown because that's the way my mind works!!!! 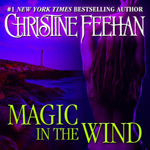 Magic in the Wind was originally released in an anthology called Lover Beware. The newer books include a new bonus chapter. "Sarah's back. Sarah's come home. 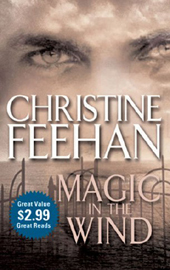 "The whisper was overly loud and tinged with something close to fear. Or respect. Damon Wilder couldn't decide which. He'd been hearing the same small town gossip for several hours and it was always said in the same hushed tones. He hated to admit to curiosity and he wasn't about to stoop to asking, not after he had made such a point of insisting on absolute privacy since he arrived last month. As he walked down the quaint narrow sidewalk made of wood, the wind seemed to whisper, "Sarah's back." He heard it as he passed the gas station and burly Jeff Dockins waved to him. He heard it as he lingered in the small bakery. Sarah. The name shouldn't carry mystery, but it did. He had no idea who Sarah was, but she commanded such interest and awe from the townspeople he found himself totally intrigued. He knew from experience the people in the sleepy little coastal town were not easily impressed. No amount of money, fame, or title earned one deference. Everyone was treated the same from the poorest to the richest and there seemed to be no prejudice against religion or any other preferences. It was why he had chosen the town. A man could be anybody here and no one cared. All day he had heard the whispers. He'd never once caught a glimpse of the mysterious Sarah. But he'd heard she once climbed the sheer cliffs above the sea to rescue a dog. An impossible task. He'd seen those crumbling cliffs and no one could climb them. He found himself smiling at the idea of anyone attempting such an impossible feat and few things amused him or intrigued him. The grocery store was the center of town and most of the gossip originated there and then spread like wildfire. Damon decided he needed a few things before he went home. He hadn't been in the store for more than two minutes when he heard it again. "Sarah's back." The same hushed whisper, the same awe and respect. Inez Nelson, owner of the only grocery store held court, spilling out gossip as she normally did, instead of ringing up the groceries on the cash register. It usually drove him crazy to have to wait, but this time he lingered by the bread rack in the hope of learning more of the mysterious Sarah who had finally returned. "Are you sure, Inez?" Trudy Garret asked, dragging her four-year-old closer to her and nearly strangling the child with her hug. "Are her sisters back too?" "Oh, I'm certain, all right. She came right into the store as real as you please and bought a ton of groceries. She was back at the cliff house she said. She didn't say anything about the others, but if one shows up the others aren't far behind." Damon rolled his eyes. Everyone always annoyed the hell out of him. He thought moving to a small town would allow him to find a way to get along to some extent but people were just plain idiots. Of course Sarah was still Sarah. Who the hell else would she be? He let his breath out in a rush of impatience. Sarah was probably the only one with a brain within a fifty-mile radius so they thought she was different. "What could it mean?" Trudy asked. "Sarah only comes back when something is going to happen." "I asked her if everything was all right and she just smiled in that way she has and said yes. You wouldn't want me to pry into Sarah's business, now would you dear," Inez said piously. Damon let his breath out in a hissing rush of impatience. Inez made it her life's work to pry into everyone's business. Why should the absent Sarah be excluded?
" She trailed off and glanced around the store and lowered her voice to a conspirator's whisper. "Old Mars at the fruit stand said Penny told him Sarah ..."
"Trudy, dear, you know Mars is totally unreliable in the things he says. He's a dear, sweet man, but he sometimes makes things up," Inez pointed out. Old man Mars was crotchety, mean and known to throw fruit at cars if he was in a foul enough mood. 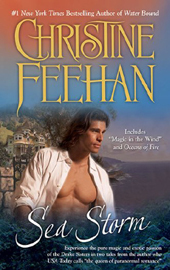 Damon waited for lightning to strike Inez for her blatant lie, but nothing happened. The worst of it was, Damon wanted to know what Old Mars had said about Sarah, even if it was a blatant lie. And that really irritated him. Trudy leaned even closer, looked melodramatically to the right and left without even noticing he was there. Damon sighed heavily, wanting to shake the woman. "Do you remember the time little Paul Baily fell into that blow hole?" "I remember that, now that you say. He was wedged in so tight and no one could get to him, he'd slipped down so far. The tide was coming in." "I was there, Inez, I saw her get him out." Trudy straightened up. 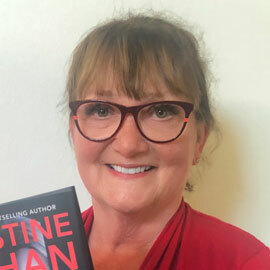 "Penny said she'd heard from her hairdresser that Sarah was working for a secret agency and she was sent to some foreign country undercover to assassinate the leader of a terrorist group." "Oh, I don't think so, Trudy. Sarah wouldn't kill anything." The store owner's hands fluttered to her throat in protest. "I just can't imagine." Damon had enough of gossip. If they weren't going to say anything worth hearing, he was going to get the hell out of there before Inez turned her spotlight on him. He plunked his groceries down on the counter and looked as bored as he could manage. "I'm in a hurry, Inez," he said, hoping to facilitate matters and avoid the usual match-making she always tried. "Why Damon Wilder, how lovely to see you. Have you met Trudy Garret? Trudy is a wonderful woman, a native of our town. She works over at the Salt Bar and Grill. Have you ever been there to eat yet? The salmon is very good." "So I've heard," he muttered, barely glancing at Trudy to acknowledge the introduction. It didn't matter. They'd all made up their minds about him, making up the history he refused to provide. He felt a little sorry for the returning Sarah. They were making up things about her as well. "You might tell me about that beautiful old house on the cliffs," he said, shocking himself. Shocking Inez. He never gave anyone an opening for conversation. He wanted to be left alone. Damn Sarah for being so mysterious. Inez looked as if she might faint and for once she was speechless. "You must know the one I'm talking about," Damon persisted, in spite of himself. "Three stories, balconies everywhere, a round turret. It's grown over quite wild around the house, but there's a path leading to the old lighthouse. I was walking up there and with all the wild growth, I expected the house to be in bad shape, dilapidated like most of the abandoned homes around here, but it was in beautiful condition. I'd like to know what preservatives were used." "That's private property, Mr. Wilder," Inez said. "The house has been in the same family for well over a hundred years. I don't know what they use in the paint, but it does weather well. No one lurks around that house." Inez was definitely issuing a reprimand to him. "I was hardly lurking, Inez," he said exasperated. "As you well know the sea salt is hard on the paint and wood of the houses. That house is in remarkable condition. In fact, it looks newly built. I'm curious as to what was used. I'd like to preserve my house in the same way." He made an effort to sound reasonable instead of annoyed. "I'm a bit of a chemist and I can't figure out what would keep a house so pristine over the years. There's no sign of damage from the sea, from age or even insects. Remarkable." Inez pursed her lips, always a bad sign. "Well I'm certain I have no idea." Her voice was stiff as if she were highly offended. She rang up his groceries in remarkable time without saying another word. Damon gathered the bags into his arm, his expression daring Inez to ask him if he needed help. Leaning heavily on his cane he turned to Trudy. "The hairdresser's dog walker told the street cleaner that he saw Sarah walk on water." Trudy's eyes widened in shock, but there was belief on her face. Inez made some kind of noise he couldn't identify. 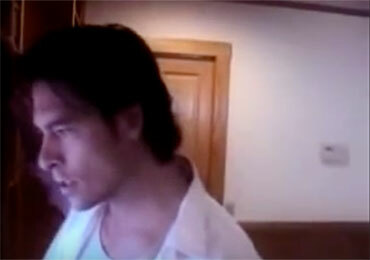 Disgusted, Damon turned on his heel and stalked out. Ever since the first whisper of Sarah's name he had been unsettled. Disturbed. Agitated. There was something unfamiliar growing inside of him. Anticipation? Excitement? That was ridiculous. He muttered a curse under his breath at the absent Sarah. He wanted to be left alone, didn't he? He had no interest in the woman the townspeople gossiped about. Sarah might not walk on water but her house was a mystery. He saw no reason why he shouldn't pay her a neighborly visit and ask what preservatives were used in the wood to achieve the nearly impossible results. Damon Wilder was a man driven to the edge of sanity. Moving to the tiny town on the coast was his last effort to hang onto life. He had no idea how he was going to do it, or why he had chosen this particular town with all its resident eccentrics, but he had been drawn here. Nothing else would do. He had stepped on the rich soil and knew either this place would be home or he had none. It was hell trying to fit in, but the sea soothed him and the long walks over million year old rocks and cliffs occupied his mind. Damon took his time putting his groceries away. The knowledge that this town, this place, was his last stand had been so strong he had actually purchased a house. His home was one of the few things that gave him pleasure. He loved the working on it. He loved the wood. He could lose himself in the artistry of reshaping a room to suit his exact needs. For hours the work occupied him so nothing else could invade his brain and he was at peace for a time. He stared out his large bay window, the one that looked out over the sea. The one that had an unobstructed view of the house on the cliff. Damon had spent more hours than he cared to think about staring up at the dark silent windows and the balconies and battlements. It was a unique house from another century, another time and place. There were lights on for the first time. The windows shone a bright welcome. His leg hurt like hell. He needed to sit and rest, not go traipsing around the countryside. Damon stared at the house, drawn to the warmth of it. It seemed almost alive, begging him to come closer. He went outside onto his deck, intending to sit in the chair and enjoy his view of the sea. Instead he found himself limping his way steadily up the path toward the cliffs. It was nearly a compulsion. The path was narrow and steep and rocky in places, almost no more than a deer trail and overgrown at that. His cane slipped on the pebbles and twice he nearly fell. He was swearing by the time he made it to the edge of the private property. He stood there staring in shock. Damon had been there not two days before, walking around the house and the grounds. It had been wildly overgrown, the bushes high and weeds everywhere. The shrubbery and trees had drooped with winter darkness on the leaves. A noticeable absence of sound had given the place an eerie, creepy feeling. Now there were flowers as if everything had burst into blossom overnight. A riot of color met his eyes, a carpet of grass was beneath his feet. The gate was open as if in welcome. He could hear the insects buzzing, the sound of frogs calling merrily back and forth as if spring had come instantly. The gate, which had been securely locked, stood open in welcome. Everything seemed to be welcoming him. A sense of peace began to steal into his heart. A part of him wanted to sit on one of the inviting benches and soak in the atmosphere. Roses climbed the trellis and rhododendrons were everywhere, great forests of them. He'd never seen such towering plants. Damon started up the pathway, noting every single weed was gone. Stepping stones led the way to the house. Each round of stone held a meticulously carved symbol. Great care had been taken to etch the symbol deep into the stone. Damon leaned down to feel the highly polished work. He admired the craftsmanship and detail. The artisans in the small town all had that trait, one he greatly respected. As he neared the house, a wind rose off the sea and carried sea spray and a lilting melody. "Sarah's back. Sarah's home." The words sang across the land joyously. It was then he heard the birds and looked around him. They were everywhere, all kinds of birds, flitting from tree to tree, a flutter of wings overhead. Squirrels chattered as they rushed from branch to branch. The sun was sinking over the ocean, turning the skyline into bright colors of pink and orange and red. The fog was on the far horizon, meeting the sea to give the impression of an island in the clouds. Damon had never seen anything so beautiful. He simply stood there, leaning on his cane and staring in wonder at the transformation around him. Voices drifted from the house. One was soft and melodious. He couldn't catch the words but the tone worked its way through his skin into his very bones. Into his vital organs. He moved closer, drawn by the sound and immediately saw two dogs on the front porch. Both were watching him alertly, heads down, hair up, neither making a sound. Damon froze. The voices continued. One was weeping. He could hear the heartbreaking sound. A woman's voice. The melodious voice soothed. Damon shifted his weight and took a two-handed grip on his cane. If he had to use it as a weapon, he'd have more leverage. Concerned as he was with the dogs, he was more centered on the voice. He strained to listen. "Please, Sarah, you have to be able to do something. I know you can. Please say you'll help me. I can't bear this," the second voice said. Her sorrow was so deep Damon ached for her. He couldn't remember the last time he'd felt someone's pain. He couldn't remember how to feel anything but bored or frustrated. The dogs both sniffed the air, and as if recognizing him, wagged their tails in greeting and sat down, hair settling to make them appear much more friendly. Keeping one eye on the dogs, he strained to catch the words spoken in that soft lilting tone. "I know it's difficult, Irene, but this isn't something like putting a Band-Aid on a scraped knee. What do the doctors say?" There was more sobbing. It shook him, hurt him, tore up his insides so that his gut churned and a terrible weight pressed on his chest. Damon forgot all about the dogs and pressed his hand over his heart. Irene Madison. He recognized the voice, knew from Inez at the grocery store that her fifteen-year-old son, Drew was terminally ill.
"There's no hope, Sarah. They said to take him home and make him comfortable. You know you can find a way. Please do this for us, for me." Damon edged closer to the house wondering what the hell she thought Sarah could do. Work a miracle? There was a small silence. The window was open, the wind setting the white lacy curtains dancing. He waited, holding his breath. Waited for Sarah's answer. Waited for the sound of her voice.
" The sobs were choking Damon. The pain was so raw in the woman. "Irene, get up! What are you doing? Stop it." "You have to say you'll come to see him. Please Sarah. Our mothers were best friends. If not for me, do it for my mother." "I'll come by, Irene. I'm not promising anything, but I'll stop by." There was resignation in that gentle voice. Weariness. "My sisters will be coming in a day or so and as soon as we're all rested we'll stop by and see what we can do." "I know you think I'm asking for a miracle, but I'm not, I just want more time with him. Come when you're rested, when the others have come and can help." The relief Irene felt spilled over to Damon and he had no clue why. Only that the weight pressing on his chest lifted and his heart soared for a moment. The voices were traveling toward him. Damon waited, his heart pounding in anticipation. He had no idea what to expect or even what he wanted, but everything in him stilled. The door opened and two women emerged to stand in the shadow of the wide columned porch. "Thank you, Sarah. Thank you so much," Irene said, clutching at Sarah's hands gratefully. "I knew you would come." She hurried down the stairs, straight past the dogs who had rushed to their mistress. Irene managed a quick smile for Damon as she passed him, her tear-stained face bright with hope. Damon leaned on his cane and stared up at Sarah.